I mentioned the other day that I have been finding my productivity workflow has been slowly molding into a combination of technology and paper. I have set up a new large Moleskine squared notebook at work to manage all my tasks and reminders. It is a modified GTD system that has 3 main areas. At the front is my Inbox. At the back is my Projects, and about half-way is my Contexts. I have modified my Inbox in one important way. I start every day by entering and highlighting the date. All my notes, ideas, and tasks go in this inbox. I use the Projects at the back to keep track of my banking and lending clients. At the end of the day, if I haven’t completed the tasks of that day, I decide whether the task will be moved to the start of my next day or placed in my contexts tab as @phone @computer, etc…Anything that needs a reminder farther in the future gets moved to Remember the Milk to remind the day it is due. 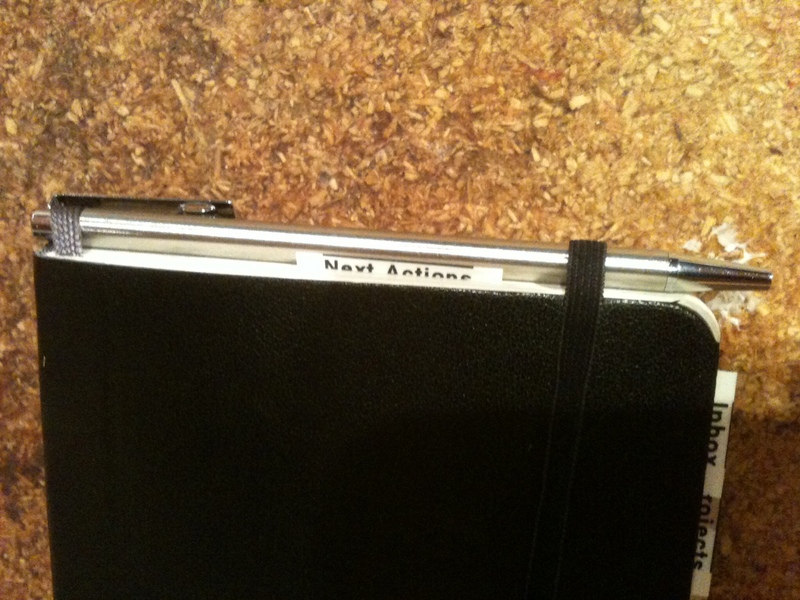 I then add that task manually to the Moleskine at the start of the day. I have been liking this modified system quite a lot, and have decided to use my personal pocket Moleskine again in much the same fashion. 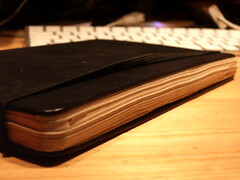 Below is my Moleskine set up that I did back in February 2011. I have not made many changes except that I now date my Inbox every day, and add my reminders from RTM. Now I have a dated task list. I like that if my wife asks me when I called someone, or what day she asked me to pick up a prescription/book/etc… I can tell her. One other thing I do is I’ve added my long distance card and password, my AirMiles Card #, and other little important items to my last page to quickly reference when I’m on the phone! There is nothing more frustrating than looking up something in your digital database on your iPhone while you are talking on your iPhone!! !You have been there, haven’t you? I have been slowly(yes,very slowly) reading Stever Robbins book, ‘9 Steps to Work Less and Do More’. Part of the book tackles our assumption the technology makes us more efficient. This is the third time in the last month that I have read about some of the inefficiencies with computers where our memory is concerned. Stever suggests doing your ToDo lists on paper and using an online calendar for tasks with a due date. Funny, though I have been using Remember the Milk as my all in one GTD and calendar solution, David Allen also eludes in his book Getting Things Done, that he uses old fashioned ‘paper’ for his lists. That’s two productivity authors that seem to think writing things down has some merit. Lifehacker also just posted an article about why we learn more effectively writing than typing. So, I have started a new GTD/ToDo experiment! I love experiments… I’ve decided to utilize my moleskine notebook more efficiently and to make it my go to place for jotting down ideas, tasks and to keep track of my life. That is, everything that I won’t be putting into Google Calendar. Following both Stever and David, I am going to utilize an online calendar for repetitive tasks, and ones that I wish to achieve on a particular day. My first action step so to speak was to get a label maker. You may have one of these already, and if you do, you are smarter than I. Why didn’t I get one years ago? They are SO cool! I bought the Brother P-Touch 90. I just bought it as Staples Business Depot for $19.95.I got it as the labels are soft, laminated, and can print double-sided so I can fold the tab and read from both sides. 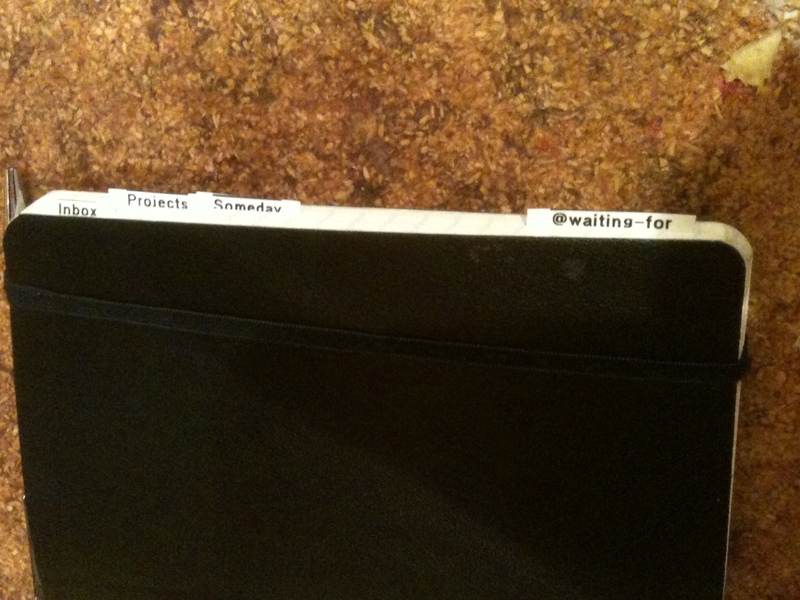 I wanted to have my labels sticking out of the Moleskine notebook, but not so much that they got in the way. I use it as my wallet too, so it needs to fit in my pocket without all the labels getting screwed up. I started by checking out this outstanding online resource about all the many uses for Moleskine notebooks. In there I found a few different articles to inspire this project. http://archives.estonbond.com/2006/11/hacking-a-gtd-moleskine/ This article is an indepth breakdown of GTD and how to best implement it with a Moleskine. http://www.shahine.com/omar/PermaLink,guid,add5aaaf-cacd-468c-bf68-d04476bf6ad3.aspx I used this article to help with how many pages to have per tab. Under my Next Actions section, I am going with a single page for each of my Contexts. I have one for @locations, @phone, @computer, etc…Once a page is completed, I start a new Contexts page…I put everything into my Inbox, and then I either add the task to a Next Action context, my Google Calendar, or in Someday/Maybe. I am interested if anyone went ‘backwards in time’ and found good old pen and paper were better at keeping track of things? Feel free to leave a comment.